^ 梦工厂要拍《功夫熊猫》 灵感来自周星驰影片. 新浪網. 2005年9月23日. ^ 《功夫熊猫》导演：灵感来自周星驰. 外滩画报. 2009年4月27日 [2013年10月10日]. （原始内容存档于2017年12月19日）. ^ The 25 All-TIME Best Animated Films. time.com. 2011年6月21日. ^ 現代黃飛鴻 功夫熊貓震天下. 非凡新聞周刊. 2008年8月10日. 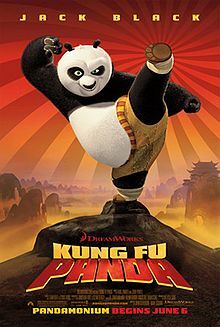 ^ Kung Fu Panda (2008). Rotten Tomatoes. [June 5, 2008]. ^ Kung Fu Panda (2008). Metacritic. [June 5, 2008]. ^ Carl DiOrio. 'Kung Fu Panda' beats projections. Hollywood Reporter. 2008-06-08 [2008-06-08]. ^ 'Panda' beats Sandler with $60 million weekend. Yahoo! Movies. 2008-06-08 [2008-06-08]. ^ Panda kicks Sandler at U.S. box office. Yahoo! Movies. 2008-06-08 [2008-06-08].